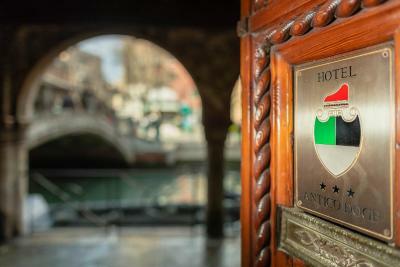 Lock in a great price for Hotel Antico Doge - rated 9.2 by recent guests. 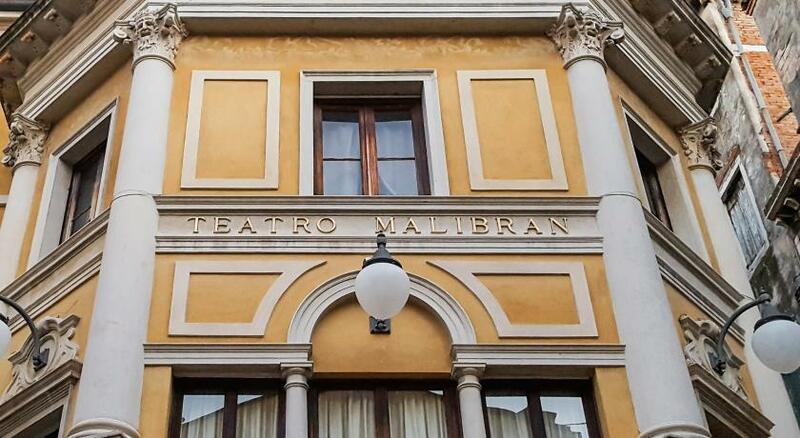 Very good location in the center of Venice. Good breakfast, we only missed some warm eggs. Friendly staff who was happy to help us and give us some information about the city. 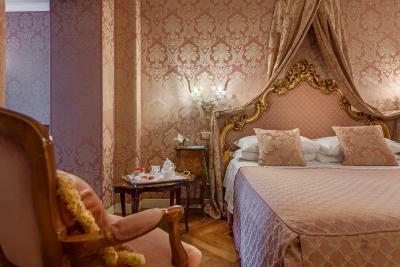 Our room and the hotel was decorated in a nice old Venetian style. The hotel itself is lovely. 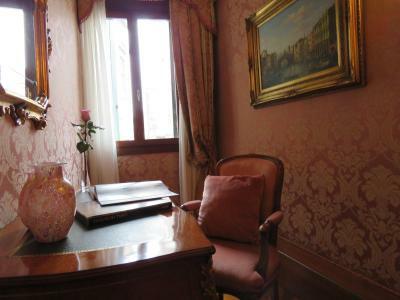 The location is superb, about 15 minutes walk from the station, 5 minutes from the Rialto Bridge, and 10 to 15 minutes from St Mark's Square. The staff were brilliant, offering advice on how to best reach various points around the city and beyond. Breakfast was busy, with a small wait on one of our mornings, but the food was fresh, with a good continental breakfast selection available. For the location and comfort of our room, I thought the hotel represented excellent value. 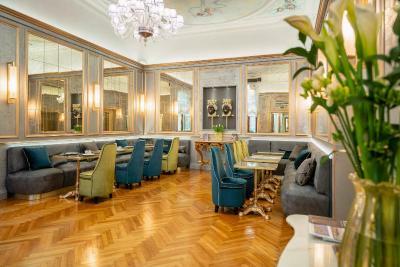 Lovely clean hotel the decor was really great and the location was only 15 minutes walk from st marks square. Beautiful room decor. The location was perfect right on a canal and next to a square. 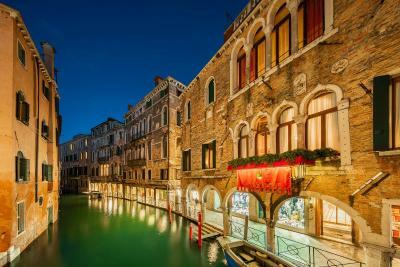 Would look to stay here again next time im in Venice. Famtastic service,location and rooms! Everything was excellenet! We will definitely visit again!! The most wonderful place to stay. A very warm and welcoming Hotel! Short break with my mum and sister. We had a triple room, felt more like a mini palace. Excellent location, staff were fabulous, the hotel was clean, comfortable, beautifully decorated and quiet. Heartily recommend and will stay again next time I'm in Venice. The hotel was easy to find, very clean. The bedroom was lovely also the was the breakfast. Super friendly staff, very high recommendation. It was very quiet. The staff were excellent. 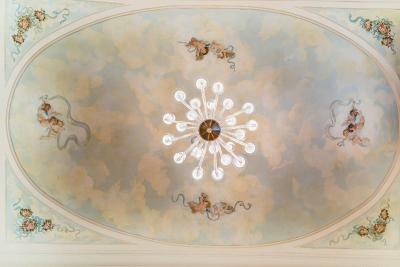 The high ceiling room was well appointed. The bathroom was pristine. 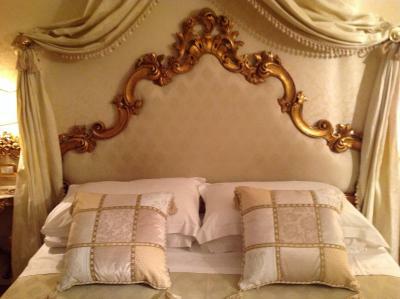 The hotel linen chosen was wonderful white crispy cotton sheets and pillowcases. Fresh thick white cotton towels every day. 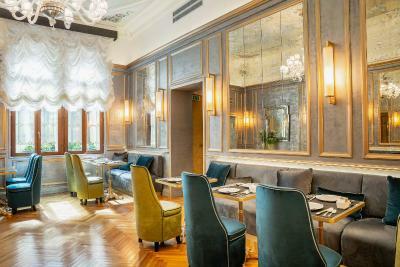 The breakfast which was included in the price was very good, in a beautiful room with nice tableware and baroque music. Antico Doge was booked as a surprise birthday trip for my partner. 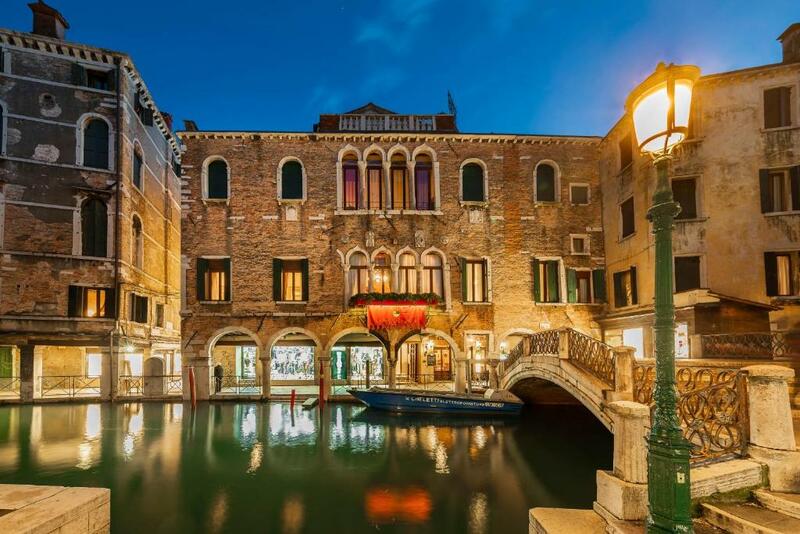 We both were pleased with everything from the traditional Venetian decor to the little personal touches including a private call to the room to enquire whether we needed a water taxi due to our early departure time. 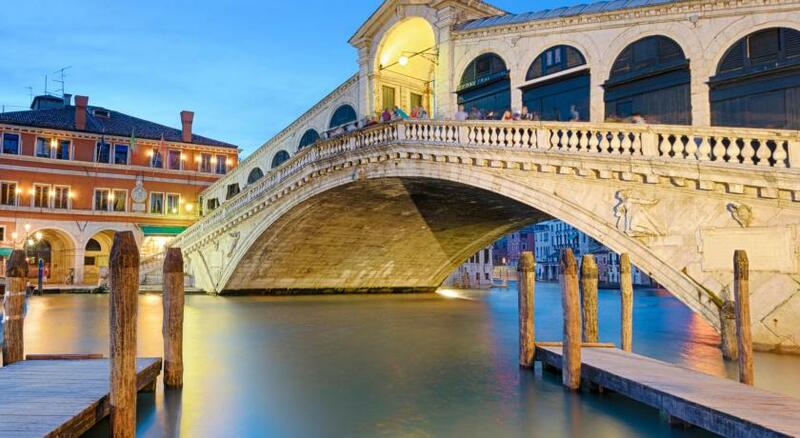 Staff were very friendly and helpful, hotel was perfectly situated near the Rialto Bridge and an awesome bar called Il Cantina which rated in the DK eyewitness travel guide 2019. 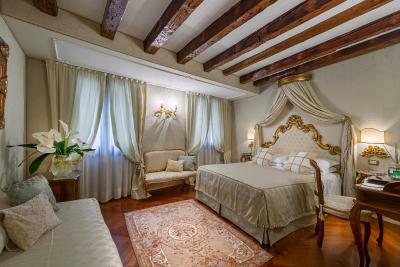 One of our top picks in Venice.This elegant 12th century building was once home to the Doge Marino Falier. 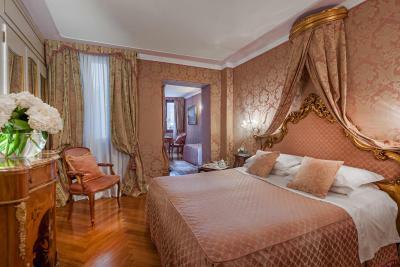 Just 350 yards from Rialto Bridge, it offers elegant rooms with antique furniture and original paintings. Rooms here are spacious and air conditioned. 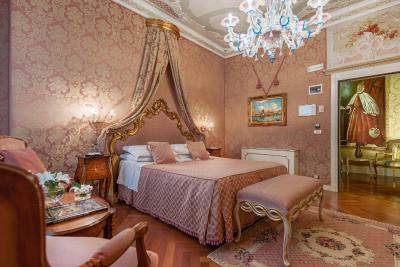 They have characteristic features such as four-poster beds or glass chandeliers. Every room has satellite TV, a minibar and Wi-Fi access. 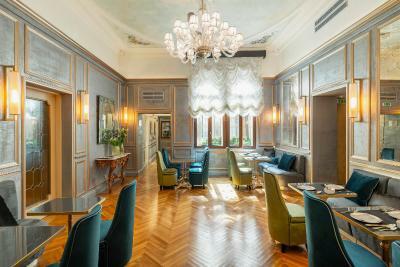 A buffet breakfast is available each morning at Hotel Antico Doge. The bar also serves hot and cold drinks throughout the day. 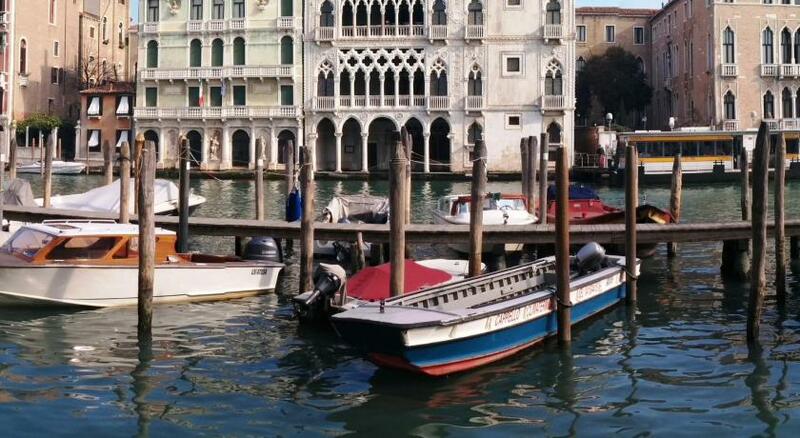 Antico Doge has great connections by Vaporetto (water bus) to Santa Lucia Train Station and Saint Mark's Square, 15 minutes' walk away. Staff can provide useful restaurant recommendations and tourist information. 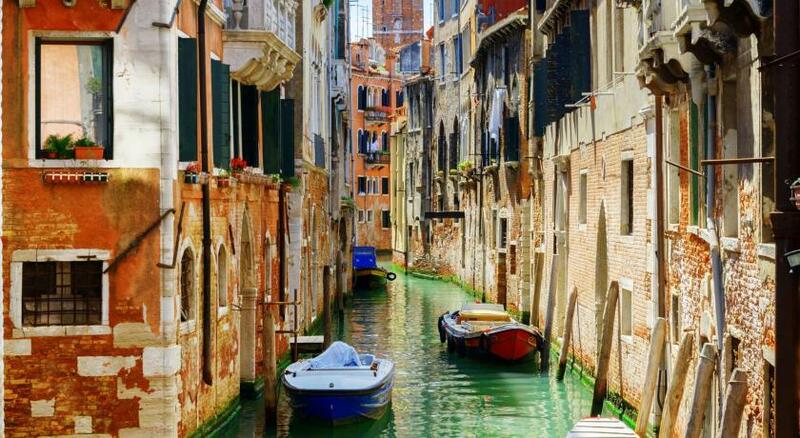 Cannaregio is a great choice for travellers interested in walking, photography and city walks. 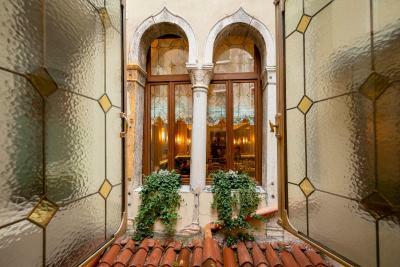 This property also has one of the best-rated locations in Venice! Guests are happier about it compared to other properties in the area. 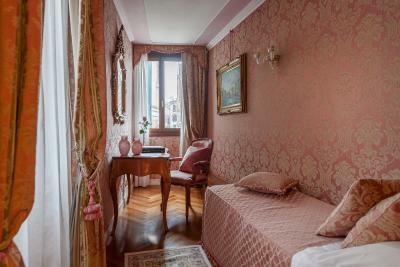 Hotel Antico Doge has been welcoming Booking.com guests since 29 Aug 2005. 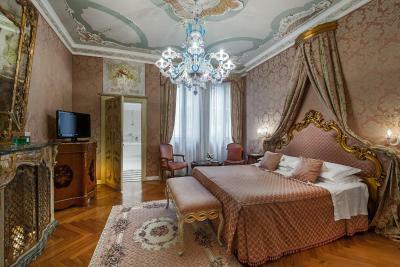 When would you like to stay at Hotel Antico Doge? 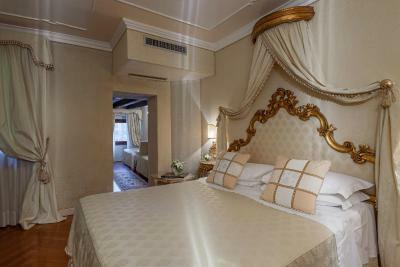 Offering free WiFi, this smaller air-conditioned room features classic furnishings, a satellite TV and minibar. 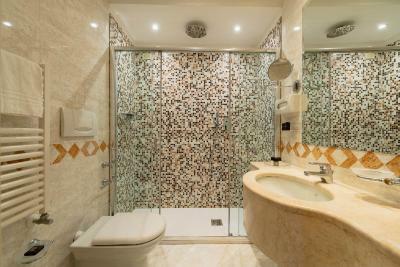 The private bathroom is complete with a shower and a hairdryer. This room overlooks the street or the courtyard. Overlooking the street or the courtyard, this elegant room features air conditioning, satellite TV, minibar and free Wi-Fi. The private bathroom is complete with a shower and a hairdryer. Overlooking the street or the courtyard, this large room with elegant furnishings offers air conditioning, a satellite TV, minibar and free Wi-Fi. The private bathroom is complete with a shower plus a hairdryer. 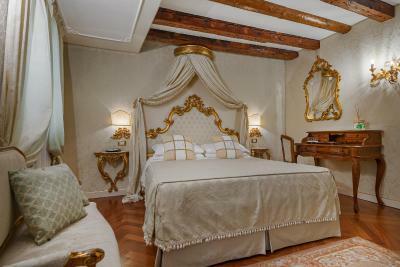 The former residence of Doge Falier, this suite is very spacious. 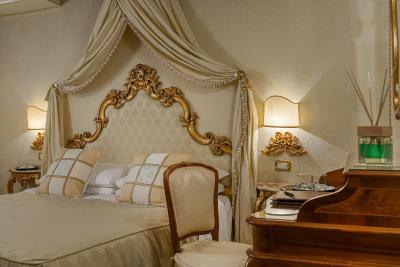 It offers a a balcony overlooking a canal and Piazza Santi Apostoli, and a four-poster bed. Modern facilities include air conditioning, free WiFi, and a satellite TV. The bathroom includes a shower. 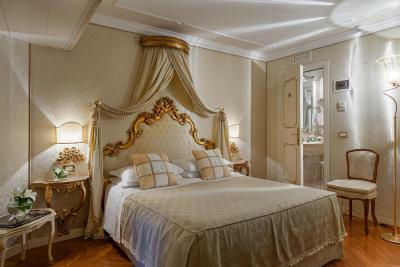 Overlooking a canal and Piazza Santi Apostoli, this large, elegant room offers air conditioning, a satellite TV, minibar and free WiFi. The private bathroom is complete with a shower and a hairdryer. Overlooking the street or the courtyard, this room with classic furnishings offers air conditioning, a satellite TV, minibar and free Wi-Fi. 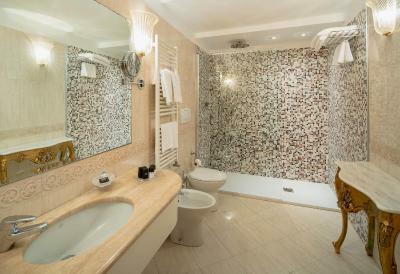 The private bathroom is complete with a shower and a hairdryer. Please specify preferred bed type when booking. Overlooking the street or the courtyard, this large room with classic furnishings offers air conditioning, a satellite TV, minibar and free Wi-Fi. The private bathroom is complete with a shower and a hairdryer. Hotel surroundings – This neighbourhood is a great choice for travellers interested in walking, photography and city walks – Check location Excellent location - show map Guests loved walking around the neighbourhood! House rules Hotel Antico Doge takes special requests - add in the next step! 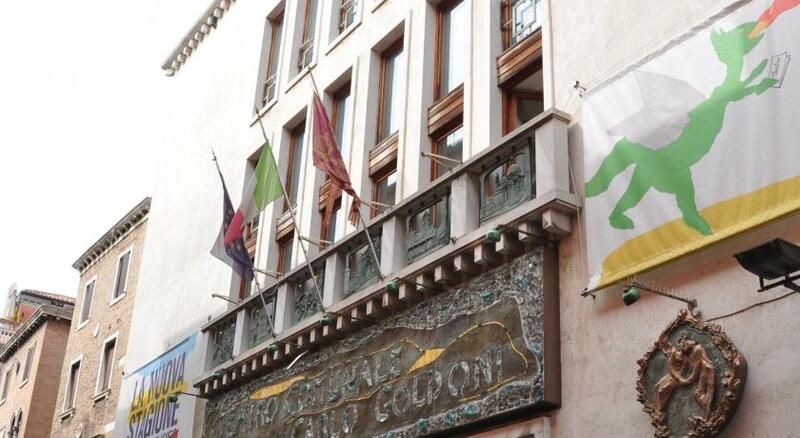 All further older children or adults are charged EUR 60 per night for extra beds. Hotel Antico Doge accepts these cards and reserves the right to temporarily hold an amount prior to arrival. 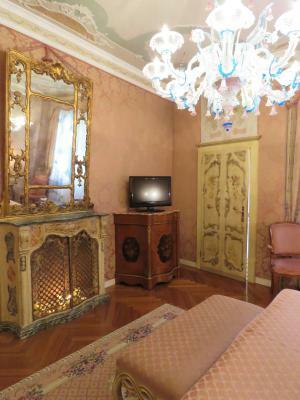 As all hotels in Venice, it was overpriced. Unfortunately there was a delivery zone on the canal in front of our room, this caused some noise disturbance in the mornings. The air conditioning did not cool the room. This meant we opened our windows which overlooked the street below. A nearby bar plays loud music until about 0030, with the accompanying shouting of its customers. The windows when shut are double glazed, and reduce the noise very well, however you can still hear the bass from the music. The room was at the very top of the hotel and it was extremely hot. We only had a small window overlooking the street below and it was very noisy if the window was left open. 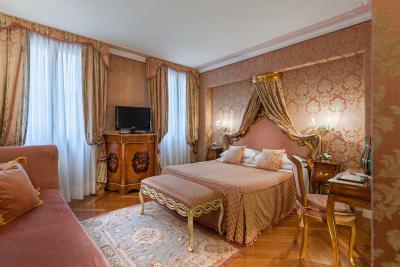 The hotel is situated on the route to Saint Marco Square and Rialto and that makes it extremely busy and noisy especially in the carnival time. The room was big, clean and very comfortable however I found the facilities poor for the price that I have paid (€256 per night) . The was only one shower cap for 2 people, the washing products were very basic and no further supplies were provided for the last night. There were some tea and coffee facilities but a basic selection again ( 2 teabags ) and no milk. We had a minibar with plenty of choices but we have not used that. The cleaning was spotless, the breakfast was nice and the staff very friendly. The hotel is good but I strongly believe it was overpriced! The room was big and comfortable! The decor of the hotel is very pretty and tasteful! 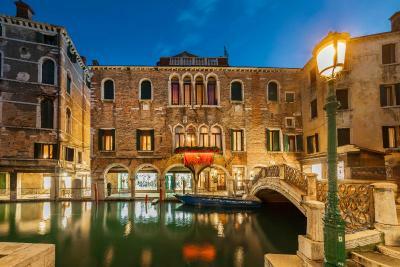 The hotel is situated in the heart of Venice, very close to Rialto and the Ca D’oro vaporetto station ! One of us liked the pillows and one of us did not (too hard). There were no softer ones available. Our room had no view. It faced another building across a tiny dead end alley. If the windows were left open, a few mosquitoes entered the room (however, a can of Raid insecticide was available in the closet). We asked the hotel to leave the windows closed during our 5-day stay and subsequently had no more mosquitos.